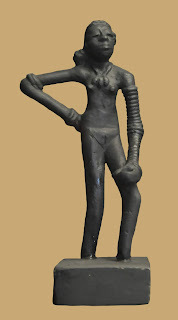 The Dancing Girl is a prehistoric bronze sculpture made around 3000 BCE in the Indus Valley Civilisation city of Mohenjo-daro, which was one of the earliest of the world's cities. The statue led to two important discoveries about the civilisation: first that they knew metal blending, the lost-wax casting technique, and other sophisticated methods, and secondly that entertainment, especially dance, was part of the culture. This amazing cultural artefact is 4.1 inches tall, and is of a naked girl wearing a number of bangles, similar to a Banjara lady, and a necklace. She appears to have been holding something in her left hand. 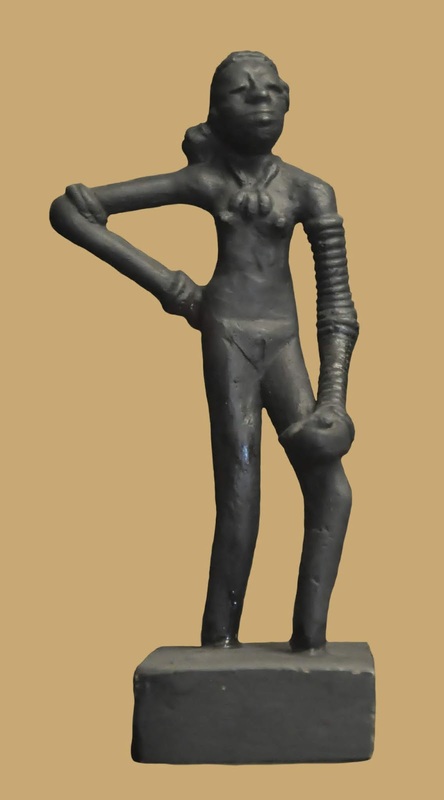 According to an archaeologist at Mohenjo-daro, depicts "a young girl, her hand on her hip in a half-impudent posture, and legs slightly forward as she beats time to the music with her legs and feet." Another archaeologist described her as, "the most captivating piece of art from an Indus site," and qualified the description of her as a dancer by stating that, "We may not be certain that she was a dancer, but she was good at what she did and she knew it." that bounce in Dhamar Taal on arms of nymph. O what silence in percussive air! a thunderous stillness finds its heir. by torches’ spluttering light from pillared citadel. this graceful, semi-naked Bronze Age doll.